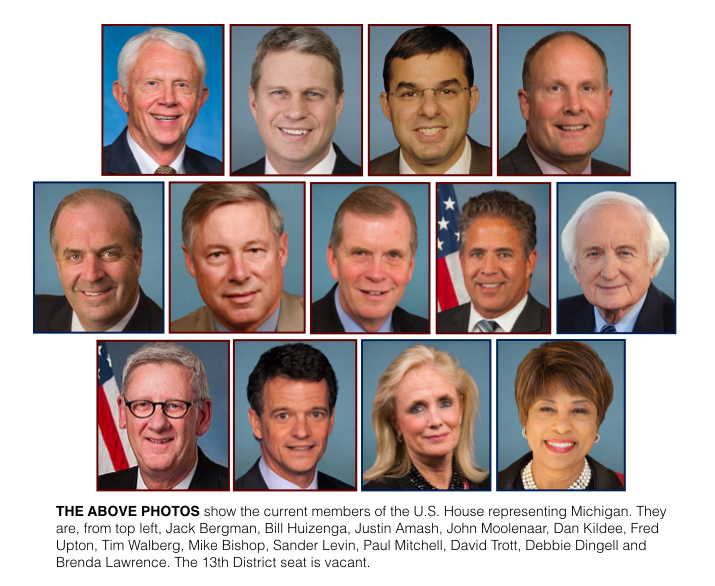 LANSING — The men and women who want to represent Michigan in the U.S. House have already raised about $22 million for their 2018 campaigns, according to new disclosures. The campaign finance reports, which were due at the federal level on Sunday, show that Democratic candidates out-raised Republican candidates over the first three months of 2018 in the five districts that tend to be Michigan’s most competitive (a list of them is below). And in most of those five districts, the candidates’ total fundraising hauls are higher in 2018 than they were at the same point in 2016. By March 31, 2016, candidates in the five districts reported raising about $9.1 million total. As of March 31, 2018, candidates in those same districts have raised about $15.0 million. Money in U.S. House races tends to follow competition, and the level of spending by groups acting independently of the candidates will ultimately determine how expensive the races turn out to be. Still, 20 different U.S House candidates have already raised more than $500,000. Among them are three Democratic women, who were the top fundraisers in Michigan from Jan. 1, 2018, through March 31, 2018. They are Elissa Slotkin, running in the 8th District, who raised $801,001 last quarter, Rashida Tlaib, running in the 13th, who raised $588,916, and Ellen Cogen Lipton, running in the 9th, who raised $501,102. A spreadsheet that summarizes the new campaign finance disclosures from U.S. House candidates and who some of the top donors to each candidate were is available at this link. The following is a brief description of the districts attracting the most campaign cash as of March 31. So far, the Oakland County-based 11th District has taken the gold medal for U.S. House fundraising in Michigan. Rep. David Trott, a Republican from Birmingham, currently holds the seat but has decided against seeking re-election. A handful of Democrats and a handful of Republicans are now hoping to win Trott’s seat, and they’re raising a lot of money to help their pursuits. On the Republican side, businesswoman Lena Epstein, of Bloomfield Hills, has raised the most at $1.48 million since the campaign began. About $990,000 of that total has come from Epstein herself, according to her campaign disclosures But the top fundraiser over the first three months of 2018 was state Sen. Mike Kowall, a Republican from White Lake, who raised $157,619. Kowall launched his campaign in early February. Kowall gave $82,000 to his own campaign. Two other Republicans, Rocky Raczkowski and Klint Kesto, have raised more than $195,000 each since launch their campaigns. On the Democratic side, businessman Suneel Gupta, of Birmingham, has raised the most money at $934,413, including $430,710 over the first quarter of 2018. One of his top donors was the 314 Action Fund, which gave $5,000. The fund works to elect more candidate with backgrounds in science, technology, engineering and math. Haley Stevens, of Rochester Hills, who was chief of staff to former President Barack Obama’s Auto Task Force, has raised $842,537 overall. Three other Democratic candidates, state Rep. Tim Greimel, Dan Haberman and Fayrouz Saad, have raised more than $250,000 each. In the 8th District, which covers Ingham County, Livingston County and a portion of Oakland County, Rep. Mike Bishop, a Republican from Rochester, is running for re-election. Bishop raised $456,778 last quarter, and he’s raised $1.56 million for the election cycle. He’s received about $1.0 million from political committees this election cycle, including $10,000 from the No Labels Problem Solvers PAC last quarter. The organization works to build trust across the aisle. 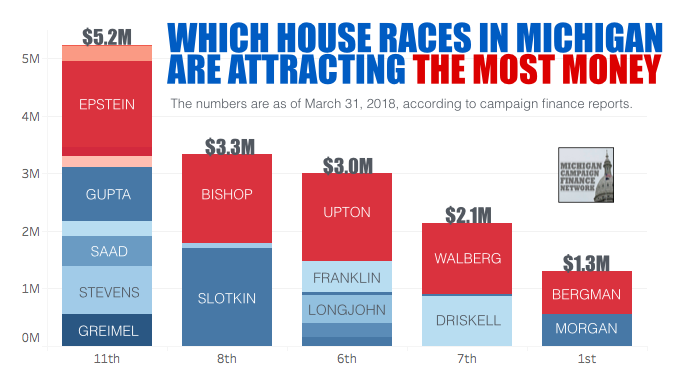 However, in recent months, Democrat Elissa Slotkin, of Holly, has been attracting more financial support than Bishop. She previously worked in the Defense Department. Slotkin raised $801,001 over the first three months of 2018. Since her campaign began, she’s raised $1.70 million. According to her disclosures, she’s received some big help in fundraising from joint fundraising committees tied to well-known Democrats in Washington D.C. Joint fundraising committees allow candidates to come together to raise money that’s taken in jointly and then divvied up among participants. Slotkin reported receiving about $57,000 through the Better Days Fund, a committee connected to U.S. Rep. Joe Crowley, a Democrat from New York, according to Politico, and about $94,000 through the Serve America Victory Fund, a committee that's reportedly connected to U.S. Rep. Seth Moulton, a Democrat from Massachusetts. Another Democrat in the 8th District race, Chris Smith, a professor from East Lansing, has raised $77,185. Rep. Fred Upton, a Republican from St. Joseph, is seeking re-election in the 6th, but he’s been out-fundraised recently by former Kellogg lobbyist George Franklin, of Glenn. Upton reported raising $172,311 over the first three months of 2018. For the election cycle, he’s raised $1.52 million. Upton reported receiving $10,800 last quarter from James and Paula Crown, of Illinois. James Crown is president of an investment firm, Henry Crown & Company. Franklin, one of many Democrats seeking the party’s nomination, raised $207,926 last quarter. For the cycle, he’s raised $534,743. Franklin has put $55,400 into his own campaign. Another Democrat, Dr. Matt Longjohn, of Portage, raised $146,342 last quarter. For the cycle, he’s raised $476,643. Since the campaign began, Longjohn has put $46,373 into his own campaign. Upton has a big advantage in cash available as of March 31. Upton still had $1.11 million on hand while Franklin had just $382,886. Rep. Tim Walberg, a Republican from Tipton, raised $282,097 over the first three months of 2018, leaving his total as of March 31 at $1.23 million. Nearly half of Walberg’s total has come from political committees, $600,400, according to his reports. Former state Rep. Gretchen Driskell, a Democrat from Saline, raised $325,577 last quarter and has raised $873,533 total for the campaign. She received $10,800 last quarter from Amy and Morgan Fowler, of New York. Another Democrat Steve Friday, of Dexter, has raised $38,419 for the campaign. Democrat Matt Morgan raised more than the 1st District incumbent, Rep. Jack Bergman, a Republican from Watersmeet, over the first quarter of 2018. Morgan, a career Marine Corps officer from Traverse City, has raised $202,707 in 2018 while Bergman has raised $145,555. For the entire campaign, however, Bergman has raised more at $742,190 to Morgan’s $562,463. Morgan has given $80,243 to his own campaign, according to his disclosures. Bergman received $10,000 from the John Bolton PAC in February. The PAC is connected to John Bolton, who was recently named assistant to President Donald Trump for national security affairs. — The 9th District seat is open this year as Rep. Sander Levin, a Democrat from Royal Oak, decided against seeking re-election. Of the candidates to replace him, former state Rep. Ellen Cogen Lipton, a Democrat from Huntington Woods, raised the most money last quarter, at $501,102. But Andy Levin, a Democrat from Bloomfield Township and Sander Levin’s son, has raised the most overall at $510,927. — The 13th District is open because Rep. John Conyers, a Democrat from Detroit. decided to leave the U.S. House. The top fundraiser in the race to replace him has been former state Rep. Rashida Tlaib, a Democrat from Detroit. She’s reported raising $588,916 since launching her campaign.